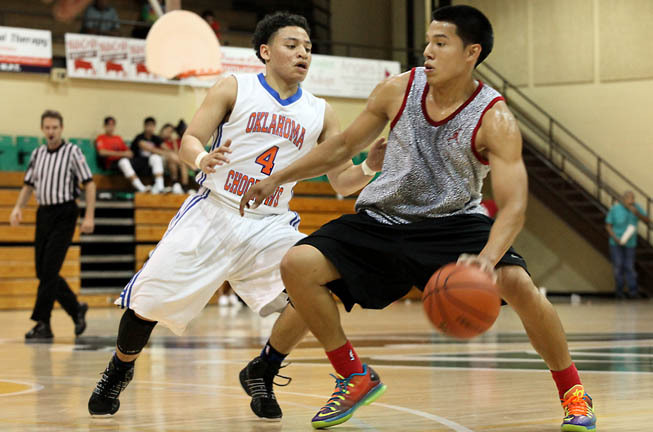 SHAWNEE, Okla. — Young Seminole athletes showed spirited determination June 8-14 at the Jim Thorpe Native American Games in Shawnee, Okla. Despite rain-soaked fields, slim turnout for individual sports and the cancellation of all softball events due to severe storms during the prior week, competitive attitudes prevailed. “It’s a fun and good experience. We get to travel, hang with friends and play a lot of basketball,” said Nicholas Smith, who played for the 19U Rez Ballers out of Brighton Reservation. Coach Theresa Frost drove the team halfway across the country in a cozy recreation vehicle. “For me, it’s not about the winning; it’s the journey. Getting the boys away from the reservation to see the world is the blessing,” she said. Though Seminole members did not place first in events that included golf, wrestling, basketball and track, some took home silver and bronze medals. JUS Nation, 19U basketball, won four games and earned a bronze for third place. Formed five years ago, the team is co-coached by Andrew Jordan Bowers and consists of Florida Seminole members and Winnebago Tribe members of Nebraska. “It all started with the players’ older brothers; when we’d show up with five players, they showed up with five players, and we combined so we’d have one team … Now, we’re keeping it in the family,” Bowers said. Players included Hollywood Reservation’s Hunter Osceola, a point guard who recently played on the state championship American Heritage basketball team. American Heritage junior Trewston Pierce, of Hollywood, also played on JUS Nation. Hollywood brothers Conchade and Byron Osceola placed second and third, respectively, in boys golf for ages 12-14. Mallorie Thomas, of Brighton, finished fourth in the 400-meter race, and Danyelle Boromei, also of Brighton, placed fourth in the long jump. Gigi Tannehill, a consultant for the event, said 1,600 athletes registered to play 11 sports in the seven-day event held to honor the late Olympic gold winner James Francis “Jim” Thorpe, of the Sac and Fox Tribe of Oklahoma. Thorpe won the pentathlon and decathlon in the 1912 Olympics. Considered the most versatile athlete in modern history, Thorpe also played college and professional football, baseball and basketball. He was voted the greatest athlete of the 20th century in an ABC Sports poll. Tannehill said about 4,000 people attended the opening ceremony at Firelake Arena in Shawnee. Participating Tribes included the nearby Kickapoo, Sac and Fox, Muscogee, Cherokee, Chickasaw, Pottawatomie, Shawnee, Cheyenne and Arapaho, and Seminole Nation Tribes. Two athletes were awarded $2,500 each in college scholarships. “We want children to know that they don’t have to stay in one place. They can be a Schimmel sister or the next Jim Thorpe,” Tannehill said. Thorpe’s son, Bill Thorpe, 85, was on hand at the annual games that began in 2012 on the 100th anniversary of his father’s Olympic wins. “I think it’s wonderful to have the youngsters train during the year to come out here and play. It builds the athlete in them and it’s the Thorpe name living on,” Bill Thorpe said. He hopes the games will become popular enough to host satellite events in Washington, California, New York and South Florida.